Auburn University is now the first Adobe Creative Campus in the Southeastern Conference. Through a partnership with the global software company Adobe Systems, Inc., Auburn is providing its students free access to the Adobe Creative Cloud platform—a suite of content design products that includes popular applications such as Photoshop, Illustrator, InDesign, Premiere Pro, Dreamweaver and After Effects. The new offering for students follows a collaborative effort between Adobe and many university divisions, including the Office of the Provost, Office of Information Technology, Division of Student Affairs and Athletics. Faculty and staff licenses are also offered at a substantial discount to departments in order to facilitate collaboration in the classroom and across campus. Providing Creative Cloud to all students further enhances the university’s innovative digital learning environment. Creative Cloud access will empower students to work with photos and videos from their research, leverage new technologies such as virtual reality or additive manufacturing, otherwise known as 3D printing, and it will give students the tools to digitally share their stories and collaborate more easily with others. Being an Adobe Creative Campus also affords Auburn students the opportunity to experience skills that are in high demand in the job market. More than 90 percent of the world’s creative professionals use Photoshop, and Adobe Creative Cloud mobile apps have been downloaded 282 million times. Creative Cloud connects Adobe users seamlessly together with their assets through Creative Cloud Libraries, enabling them to work effortlessly across desktop and mobile devices for connected creative workflows. 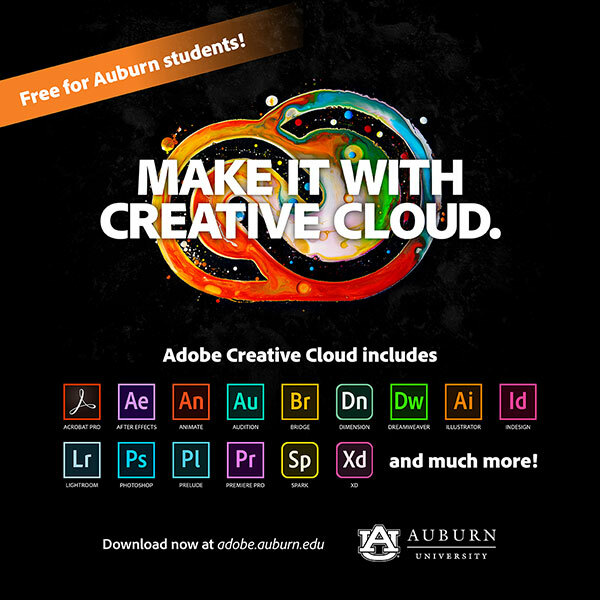 Auburn students now have access to the full suite of Creative Cloud and can access the new offering at adobe.auburn.edu using the student sign-up portal. Students seeking more information on this offering can contact adobe@auburn.edu.